MOTTO: "I'm mean to the core... I got meanness oozing out of every pore." Driven by anger and galvanized by confidence in his craft, Spittor will do whatever necessary to achieve his deadly assignments. 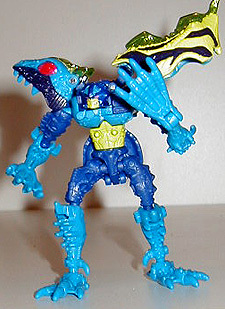 Highly skilled under sea and on land, he is the soundless warrior who Megatron reserves for the jobs that require seamless execution -a true professional. 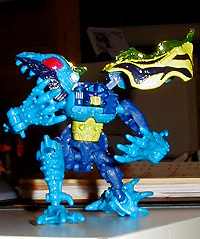 Covered in poison from head to tail, it was rumored that rubbing his back would bring luck but only resulted in several Predacons slipping into severe and extended dementia. 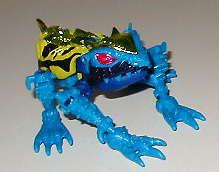 Dangerously patient; has an electro-venom tongue which actually detaches to be wielded as a weapon in robot mode. Can leap one quarter mile in a single bound. Has camouflaged spinal claw that eliminates frontal attacks. 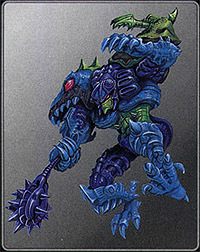 Unrefined and consumed by repressed anger; dislikes all things but is extremely devoted to Megatron.